Harassment, intimidation, even bathroom breaks denied. That's some of the "unconscionable behavior" a former Wells Fargo worker drove five hours to confront a bank executive about. Nathan Todd Davis said at a California State Assembly hearing on the Wells Fargo (WFC) fake account scandal that he filed 50 ethics complaints during his decade of working at Wells Fargo -- but nothing was ever done. "The sales culture of Wells Fargo needs to be picked apart," he said, standing at the podium but looking to his right to address Galasso. Davis estimated that almost two-thirds of Wells Fargo employees "cheat the system" due to unreasonable sales pressure. After a decade at Wells Fargo, Davis said he was fired in June 2016 for being "90 seconds late to work." The real problem, he said, was that he never "made it to management because I don't cheat." Galasso, who serves as Wells Fargo's head of community banking in Northern and Central California, did not address Davis' comments directly. 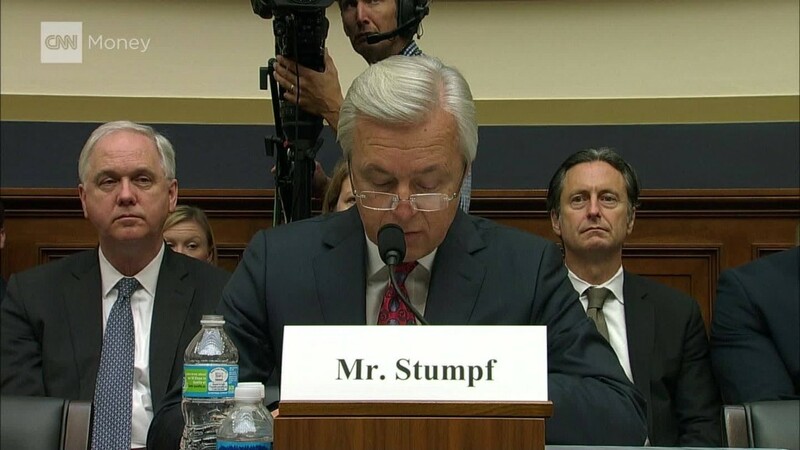 Wells Fargo declined to comment on the individual allegations, but said in a statement that it tries to make every employee "feel valued, rewarded and recognized." The allegations by Davis echo ones made by other former and current Wells Fargo employees to CNNMoney. After regulators accused Wells Fargo of creating as many as 2 million unauthorized accounts, workers reached out to lay the blame on the bank's unrealistic sales goals that led many to cheat. Other former Wells Fargo workers believe they were retaliated against after they called the ethics line. The Labor Department has since said it's reviewing whistleblower retaliation complaints against Wells Fargo.